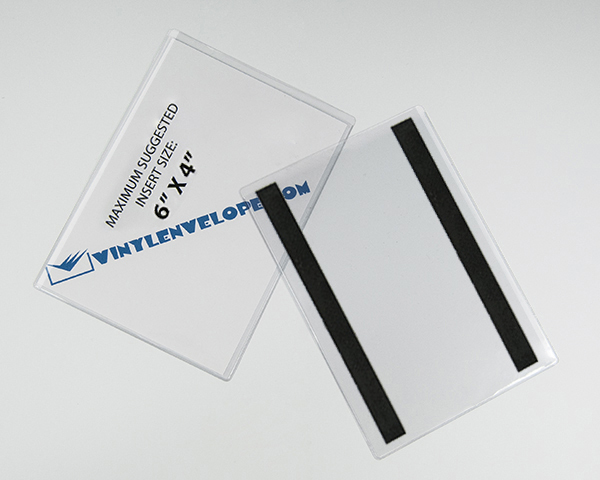 High-quality clear vinyl sleeve label holder document pouch with TWO 1/2" x 6" adhesive magnetic strips applied to the back. Use to store or protect practically anything you can imagine. Made from heavy 8-gauge clear material on the front and back. Use the magnetic strips to attach the pouch to magnetic-receptive metal surfaces. Use as a bin label, sign holder, sheet protector, job jacket, KAN BAN card holder, picture holder or document holder.Why are our prices lower than what you see elsewhere?. Because we are the manufacturer of this product so you get more for your money. Store, display or protect your documents or other items. There are endless uses for clear vinyl plastic sleeve pouches. Other sizes available. This item is sold in packages of 100 pieces. Please order in increments of 100.